We are one of the most trusted manufacturers and suppliers of Metalworking Oils in India. 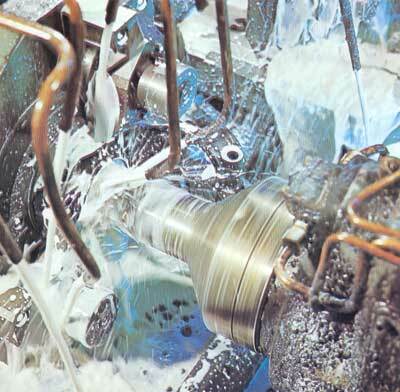 Our metal working fluids offer user high economic efficiency due to increased cutting tool life, better surface finishes, long sump life of the emulsions and safety for machine operators and the environment. Mizar Soluble (S) 400 is a soluble type high quality cutting oil which yields rich milky emulsion with water. It contains rust inhibitors which impart anti rust and anti corrosive properties to the emulsion. Carefully selected biocide is incorporated to prevent bacterial growth in the emulsion. The cutting oil has superior cooling and lubricating properties which contributes towards clear work. Provides long lasting stable emulsion. SUN CHEM SULFCUT series oil are neat cutting oils which contain either chlorinated fatty additives, sulphurised Extreme Pressure additive or Active sulphur. All the additives are selectively chosen for each grade so that the best performance is obtained in cutting, thread grinding, machining operations, etc. SUNSYN GR FLUIDS are specially recommended for grinding of ferrous metals, high nickel and titanium alloys, specially for grinding of open grain cast irons which tends to rust quickly after machining. These fluids are recommended for grinding operations of Iron, Steel, Non-alloyed Steels and Nickel Chromium Steels. It should not be used for grinding aluminum, zinc, copper or magnesium alloys, tin or cadmium coated parts. Dilution range for the products varies from 5% to 10%. These water soluble grinding fluids besides rendering remarkable antirust properties, give longer service life to grinding wheels and good ground finish. They do not emanate obnoxious odour even when machine is shut down and fluid is not kept in circulation as they are not attacked by bacteria. The solution maintains the clarity throughout the service period. They remove grinding debris quickly and keep the wheel exceptionally clean. They do not give skin irritation when used in proper dilution range. Long life, high quality, low viscosity dielectric fluid designed to perform flawlessly over a broad range of metal removal rates. The product isÂ Odor Free and Colorless which create an atmosphere conducive to excellence. The low viscosity ofÂ SunÂ EDM OilÂ provides, improved flushing and particle settling. This contributes to faster machining rates and fine surface finishes. Premium quality low viscosity straight mineral oil, especially developed for cold rolling operation without affecting gauge accuracy. Its narrow boiling range and high IBP reduces the evaporation rate thereby bringing down the roll coolant consumption. It has inherent oiliness property to reduce friction, help metal reduction without permitting slippage. It is non-staining and non-corrosive and has good additive solubility for fats and alcohols which are added by the aluminium manufacturers for production advantages.